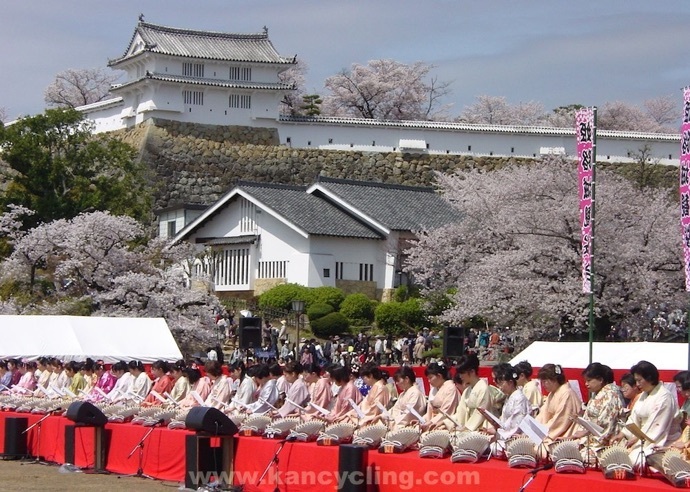 Every year the city of Himeji (just west of Kobe) holds a cherry blossom festival (kan-o-kai), usually on the first Saturday in April. 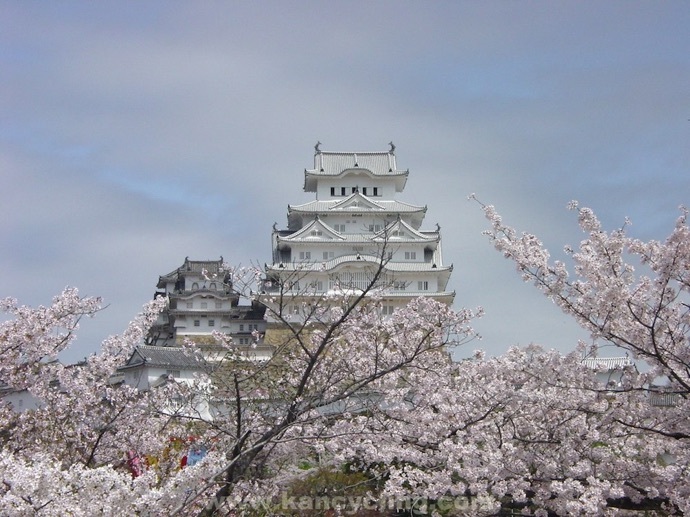 Many cities and towns do the same; what makes Himeji’s special is that Himeji Castle is indisputably the finest surviving castle in Japan (in samurai dramas, it’s always the one they show the feudal lord riding out of for dramatic effect). 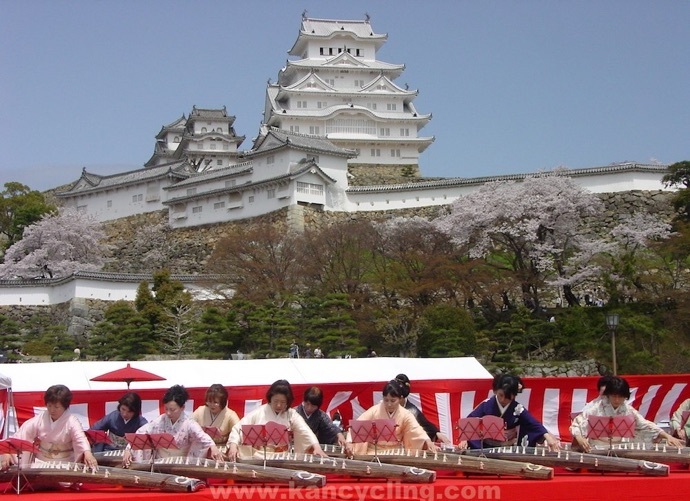 And in addition to kodo drumming and other events, Himeji’s festival features something unique: a long stage in front of the castle, featuring double rows of koto on which dozens of women in kimono play traditional Japanese music. 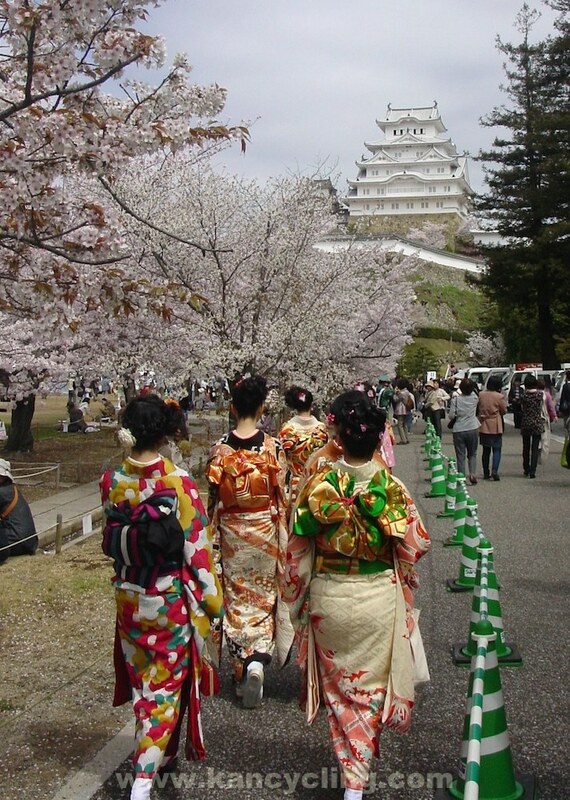 It’s practically every element of traditional Japan all in one place: kimono, cherry blossoms, koto music, and a magnificent medieval castle. 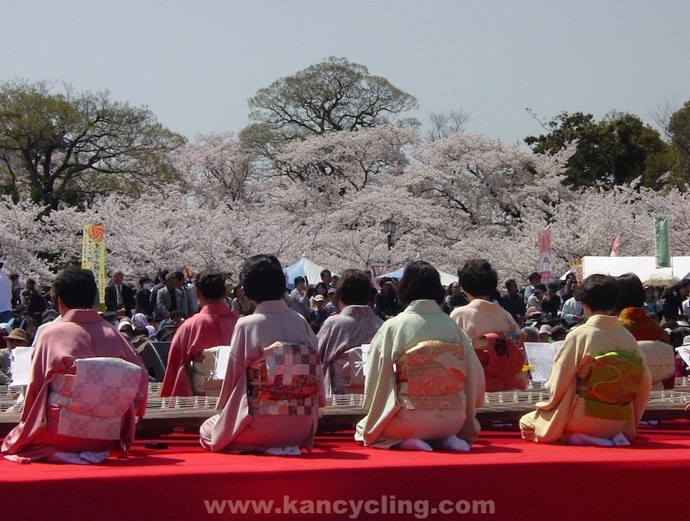 Add to that delicious local Japanese sake at ¥100 a cup and a huge crowd of people eager to celebrate the arrival of warm weather after the long winter, and you have the makings of an unforgettable party. And this year, the stakes were particularly high. 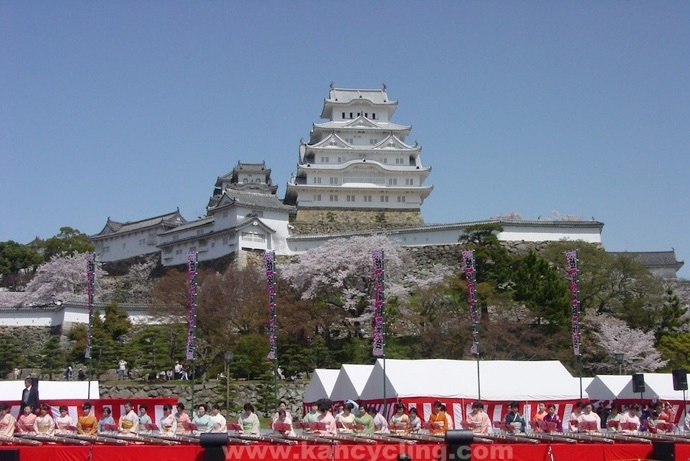 For several years, the castle has been hidden by scaffolding due to a major restoration that was only completed about a week ago. So, following the official unveiling last week, this year’s festival was set to be a major coming-out event. But the weather reports were all bad, predicting rain and strong winds for the whole weekend. 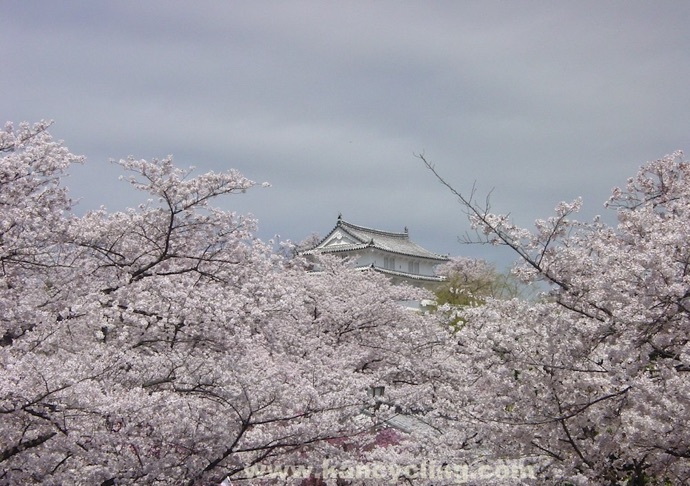 (In addition to being unpleasant, that’s the worst-case scenario — it warms up, the blossoms pop open, and rain and strong winds send them immediately to the ground. Game over.) On Friday, the day before the festival, there was the hope of a (literal) ray of sunlight: the weather report was predicting a narrow window of good weather for around 11 a.m. on Saturday. So I went, but I wasn’t holding out much hope. People come to this event hoping the cherry blossoms will be in full bloom (which they certainly were this year), with the aim of taking photos like these next two. As you can see, the skies were gradually getting clearer. And this is the big payoff. 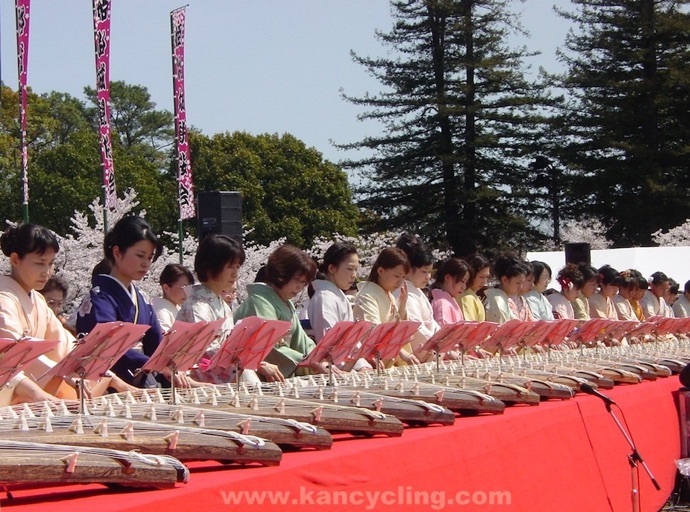 Unbelievably, by the time of the koto performance, there was quite literally not a cloud in the sky. Nobody could believe it. And as soon as the koto performance was over, it started to slowly cloud up again, and the rain started again that evening. 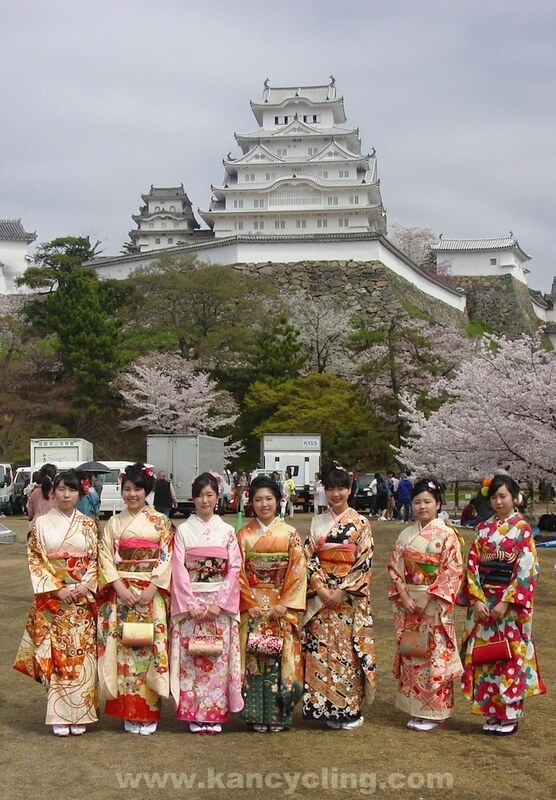 It had cleared up just enough to make the renovated Himeji Castle coming-out party a smashing success. Somebody up there must like us.